The puzzle that will tease your brain *and* allow you to be creative, Roundominoes is so pretty that you'll want to put it on display when you're not attempting one of the challenges. Whether you root for the Starks, Lannisters, or Greyjoys, you'll enjoy this 4D version of Westeros that features three levels of puzzle for you to put together. An addictive puzzler of a game you can play by yourself (how many pieces can you stack?) or in a group. Magnetic repulsion is cool. The most gorgeously difficult puzzle you'll ever attempt to construct. Your task is to guide a metal ball through seven layers of mazes: mazes that you can't actually see the ball rolling through. There are five different versions of these patience-testing cubes: Easy, Mean, Awful, Vicious, and Mortal. You may be cocky enough to think you could beat the Vicious version, but it would *probably* be best to start with Easy and work your way up. Upload a photo or drawing and have it turned into an intricate puzzle made using a laser cutter. You also get to choose the shape (circle, square, or octagon) and add in several special "whimsie" pieces (like the leaves or the astronauts you see in the puzzles above). Like Tinker Toys, these puzzles are made up of an array of seeds and rods. *Unlike* Tinker Toys, you may get a wee bit frustrated as you try to figure out how to put them together. It's all worth it. The segments of the "brain" are actually squishy (an icky yet ingenious detail). This puzzle features the spines of an array of vintage cookbooks and would make a wonderful gift for people who love to spend time making things in the kitchen. After you finish the cell puzzle, you can try the particle or the molecule. Picture a Rubix cube. Now picture a Rubix cube that you need to have math skills in order to solve—that's the Magic Cube. What a nightmare. These Lock Nesters are more challenging than they look: keep one on your desk and fiddle around with it during boring phone calls. For people whose record collection is as big as their puzzle collection. Prefer to do your puzzles on paper? Here's an intricate maze that will have you scratching your head for hours—it took artist Kazuo Nomura two months to design it! It's a puzzle, but it's also pretty. So very pretty. Perfect for anyone who used to adore playing with pattern blocks during elementary school. This sculptural puzzle comes in a set of 16 concrete prisms that "can be arranged in millions of variations, allowing you to find endless patterns in its computer-generated forms." The puzzle you can decorate your house with (also available in bison, elephant, deer, or longhorn form). Pick a date, any date. Seriously! Make your selection (your day of birth, the day of a historical event) and they'll print it up for you. There are very few date restrictions, but you can see them here. Another customizable option, the Postcode Puzzle is exactly what it sounds like: a jigsaw puzzle featuring the postcode of your choice. Be sure to choose a Puxxle puzzle that you enjoy the look of, because you'll be putting it together ON YOUR WALL—they're pixelated decals! Click here for more information about how it works. Step one: Complete the puzzle. Step two: Complete the maze. Step three: Give yourself a big ol' pat on the back. Don't be deceived by their cuteness: these little guys are truly difficult to solve. Pop one in your pocket and attempt to work out the solution whenever you're waiting in line or sitting in traffic. Have a hard time solving a Rubix cube? You're apt to have a *really* hard time solving the Dreidel. Like the Rubix, there are 26 little blocks to spin around and organize, but each of those little blocks has many other spin-able pieces attached. Good luck! After successfully completing the puzzle, feel free to stack up the faces in a strange (and amazing) totem-pole-style tower. For anyone who loves bacon as much as they love puzzles. Everyone should have a globe—why not have one that actually requires you to learn about geography during the process of putting it together? Like Sudoku... only with colors instead of numbers. 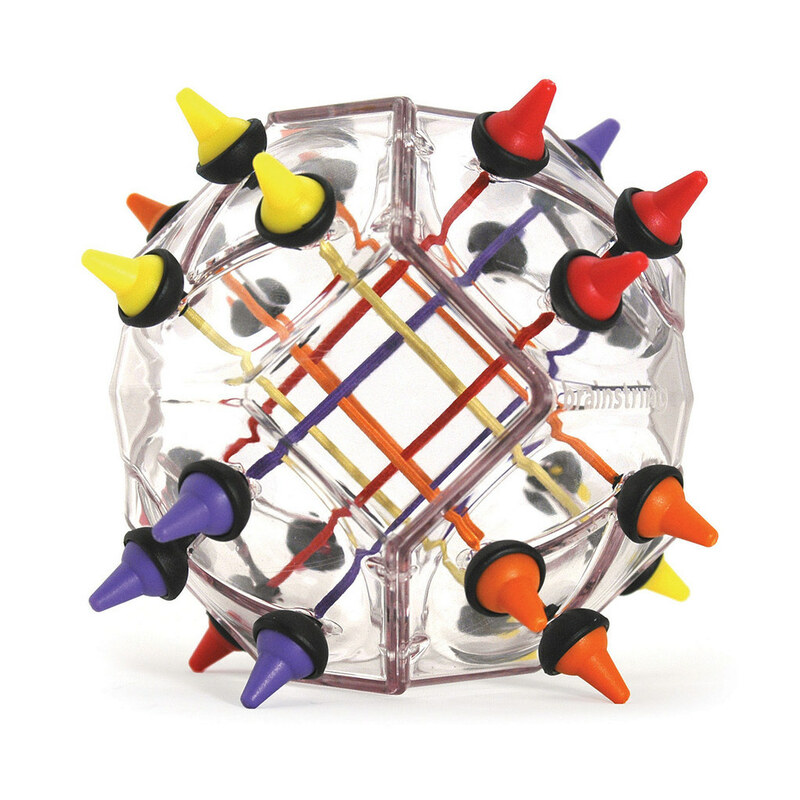 A knotty puzzle that will test your spatial awareness skills as you slide around the little plastic pieces in an attempt to group them by color *without* tangling up the cords inside the case.